by breakfreebefit January 31, 2019 February 13, 2018 1 Comment on Are you too old to get fit? If you could go back 10 years, what would you tell yourself? Guys, I was scrolling through some old photos and happened to see one from 10 years ago. I had a five-month-old in tow, just like I do now. When I see myself, though, I see a totally different mom. A stressed out; exhausted; sick and lethargic mom. I was convinced that even in my 20s, I was too old to get fit. My overall wellness used to depend on a steady flow of bad carbs and diet soda. This is no secret and the reason this blog came to be. The physical effects of what that looks like, though, is kind of crazy. When I looked at myself in the photo from ten-years-ago, I see a very tired mom. A mom with an immune system suppressed by poor diet; binge eating; and LOTS of stress. Unfortunately, I used my poor food choices to deal with stress and I was seemingly forever stuck in this vicious cycle of feeding the beast and gaining more stress and sickness because of it. Since I was convinced that I was too old to get fit, that self-doubt just fueled my dysfunctional pattern of yo-yo dieting and lack of exercise. 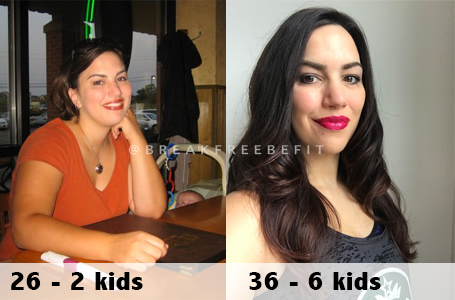 Even though my body is 10 years older, guys, I have to say I feel much better at 36 with six kids than I did at 26 with two kids. I have way more energy and don’t feel bogged down by my poor food choices. It’s kind of scary to think about how I may feel now had I continued on that path. If you have been stuck in this cycle feeding your emotions with food for far too long (like I was), you know how damaging that can be on not only your physical body but also your mental wellbeing. I have news for you. You are not too old to get fit…but check your attitude. Your attitude determines the outcome and you need to know – you can do this! No matter how long you’ve been using food for comfort; no matter how many times you’ve had to start over; no matter how old you are, you can absolutely stop doing it. Yes, it will be difficult. No, you will not feel better after the first day (or even the first week), but you will feel better if you stick to unprocessed, clean foods. 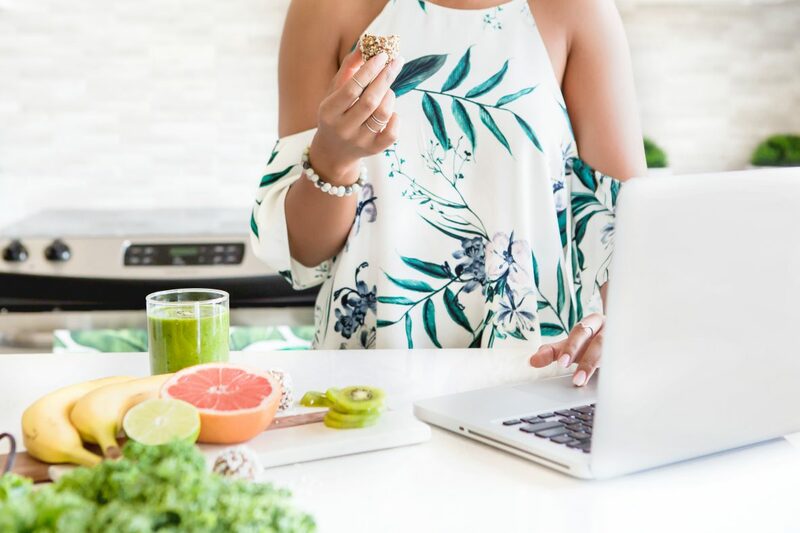 I have five tips for making this happen before your next meal (contrary to popular belief, you don’t have to wait until Monday or the first of the month to start living better). You aren’t too old to get fit and you can start good habits right now! Nix white flour; white rice; white noodles; and added sugar right frickin’ now. Taking this step right out of the gate will improve your lethargy and cognitive function – stat! Taking these items out of your diet will cut your cravings and likely reduce inflammation right way. PS. If you’re eating the aforementioned things, you most likely have inflammation and don’t even realize it. Stop the artificial sweeteners. I know most people drink diet soda to help them lose weight (I did, for years!!!). The fact is, it’s really only fueling your sugar cravings and stopping you from nixing all the other problem items. I’m not a scientist, but I will tell you that when I cut my diet soda habit, I felt healthier than I had for a LONG time. It was the first time I wasn’t tempted to binge eat and the first time I was okay going sugar-free. Drink more water. I have news for you. Most of the things we drink on a daily basis don’t count as hydration. We don’t just drink to quench thirst, folks. Every system in your body needs water to function properly. Get yourself some measure-marked water bottles and make sure you drink half of your body weight in ounces each day. Yes, you will be going to the toilet more. You will live, k? Keep track of your food. I suggest MyFitnessPal (a free app/website) that helps you track caloric intake and a variety of macro and micronutrients as well as all that water you’re going to drink now. This may seem cumbersome at first, but it’s truly the way to start and maintain a healthy relationship with food. If digital note-keeping isn’t your thing, try a good old-fashioned notebook. Put on a happy face. I’m serious now. When I had a career in complaining and telling myself “I can’t” and “I won’t” guess what? I didn’t. And I actually couldn’t, because my mind wasn’t in the right place. Sometimes you have to make a conscious effort to do the right thing 24 hours a day, 7 days a week. Again, this is not beyond your means! It cost $0 to have a good attitude, but you’ll find yourself wasting all kinds of time and energy with the wrong one. If you are ready and willing to make a change, congratulations. It’s time to get off the fence and just do it. You have an opportunity to change at this moment, and if you need to, I sure hope you do. Breaking free from the root of emotional eating and self-doubt will change your life. Previous ArticleFive ways to take charge of your health right now. Next ArticleDo you know how to stop emotional eating? – 2B Mindset can help! Right time right place in my life! Ready for change!